Some of us have no choice but to leave our dogs at home all day while we are at work, school or wherever our duties call us. If your dog is left alone for regular, long periods of time, you might want to consider getting a second dog to keep him company. 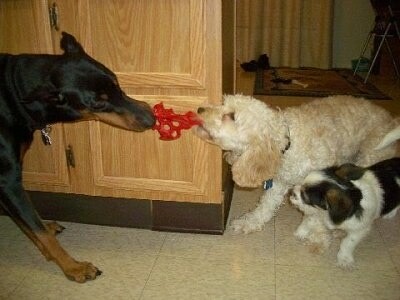 Even if you are home, your dog may enjoy having another fellow pack member around to romp around with. Having more than one dog is not for everyone, so do your homework. But it can be very rewarding for you and your dog. Just think, Fido would have someone to chew his bone with while you are away! 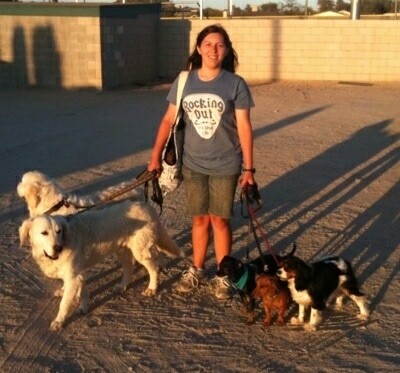 Regardless of how many dogs you have or how big your yard is dogs need a daily pack walk. Walking your dog in the morning before you go to work will help the dog(s) rest during the day while you are gone. "I have two different packs and six dogs total. Two stay at my mom's house, two at my dad's and two travel back and forth. The four that stay at each house rarely come in contact. This is a picture that was taken at a softball game during one of the rare times when almost everyone came together. The oldest dog, a Rottweiler named Lady, wasn't in well enough condition to travel to the game. But everyone else got to go. Sam and Rodeo already knew everyone. Salty and Sailor met Sasha and they blended into a single temporary pack immediately. From left to right: Sailor and Salty, seven-year-old Golden Retrievers; Sam, a two-year-old Chipin; Rodeo, a six-month-old Dachshund / Chihuahua / Whippet mix; and Sasha, a three-year-old Cavalier King Charles Spaniel." 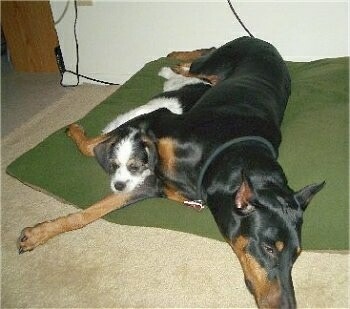 On colder days, Twiggy the Miniature Pinscher makes a daily habit of cuddling up on top of Meadow the Shiloh Shepherd. Meadow does not seem to mind one bit. Twiggy is very fast; if the Shiloh Shepherd decides to get up, she can feel the stirrings of Meadow and jump before she falls. Bed full of pups. 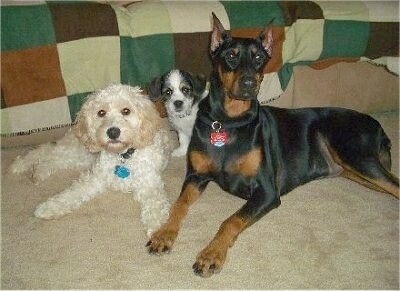 Three Boxers, Greta, Sadie and Rosie, Daisey the Boston Terrier, Bow-Tie the Toy Poodle and Rocky the Pitbull mix. 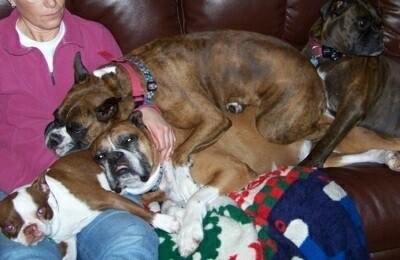 Daisey the Boston Terrier with three Boxers Greta, Sadie and Rosie on a typical night. 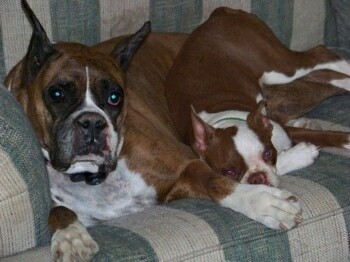 "Daisy the Boston Terrier with Greta the Boxer. This is a rare moment. 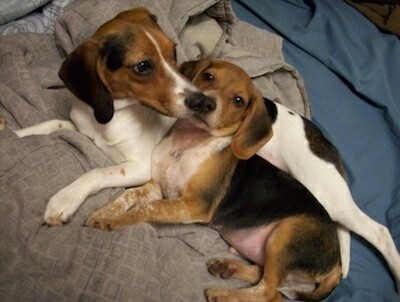 Greta is our dominant female and prefers to lie on top of others, not the other way around." Arthur, a Treeing Walker Coonhound with Wesley, a Rhodesian Ridgeback / Smooth Collie mix. "Arthur is a three-year-old Treeing Walker Coonhound. We think he is a purebred hunting dog, but as he adores our cats and has a very sweet and mild temper, he was most likely abandoned for being a poor hunter—he was only four months old. A friend found him in the ditch outside her farmhouse on Thanksgiving Day, and lucky for us, we were having dinner there that very day. Arthur came home with us and ever since we have been hound dog lovers and Arthur is a very happy urban dog! He is shown here with his little brother, Wesley (a two-year-old Rhodesian Ridgeback/Smooth Collie mix) who is also a rescue dog. His nickname is "Pavito" which means "little turkey." "Abby the English Mastweiler at 2 years old, with our mixed-breed yellow Lab and our new Great Dane and Pit Bull mix (mama is the Pit and Daddy is a gorgeous blue Great Dane, both purebreds). He was only two months old there. Abby the English Rottweiler weighs 90 pounds and is lovely and gentle and loving, and she's fairly fast, but she can't out-run the Great Dane half-breeds." 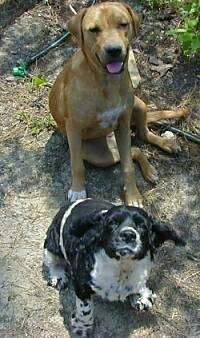 Abby the English Mastweiler (left) at one year and seven months, with her friend, a half-breed Great Dane and Golden Retriever mix. 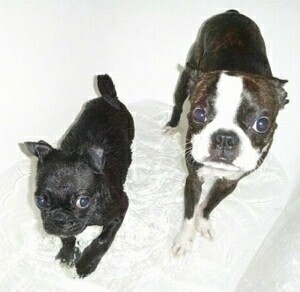 "These are my angels, Darth Vader (black Pug puppy, 16 weeks) and Bruce Wayne (brindle Boston Terrier, one and a half) getting a bath after playing in the mud outside. Bruce does not like baths but Darth, now 18 weeks, will climb into the tub if the shower doors are open." Madge the 12-week-old Dandie Dinmont keeping Stasia the Deerhound, company on her bed! "My Puli, Baby Boy, and my Husky girl, Cheska. They just love to sleep together. They both have lots of names actually, Baby Boy the Puli is also called BooBoo, Booby, Poopoo Boy, and Googy Shaggy Boy, and he reacts to each of the names! My husky has also several names, I call her Chesy Girl, Blue-eyed Princess, Baby Husky Girl and JooJoo." 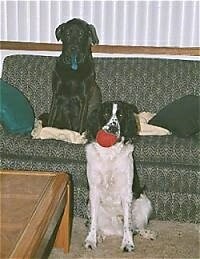 Here sits Chilipepper, a Black Lab / Golden Retriever mix up on the couch and Dash, an English Springer Spaniel hamming it up with a red ball in his mouth. 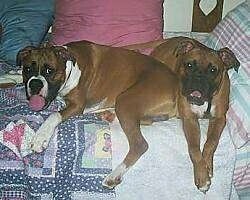 Bubba (left) 21 months and Jake (right) 16 months. They are Boxers. 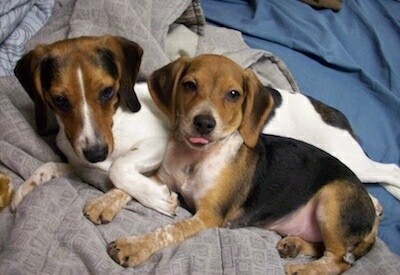 This is Angel and Jenny. 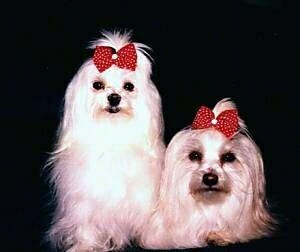 Angel (left) is a Maltese; she is four years old and weighs four pounds. Jenny (right) is a Maltese and Yorkie mix; she is three years old and weighs five pounds. Angel would walk a mile around any puddles or dirt, Jenny will plow right through them. 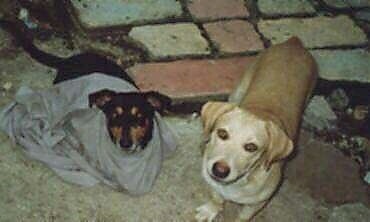 They both have won a few contests and were in some pet catalogs. Angel is very quiet and wants nothing more than to lie in my lap. Jenny is very loud and demanding and has no fear of anything. She can be very sweet and loving, but she would very much like the rest to know she is leader of the pack. They are quite the pair to watch. 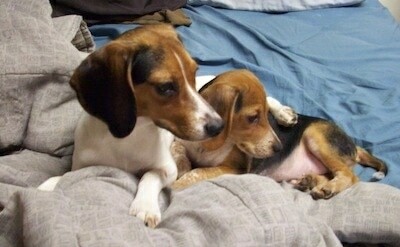 Angel is very much a momma's girl and Jenny is a daddy's girl. 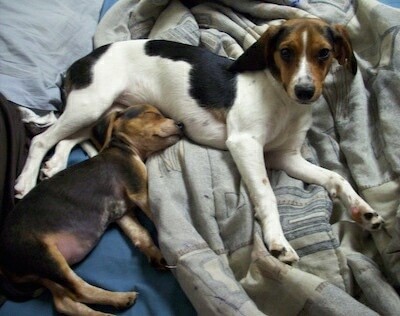 They are as different as day and night, yet they are inseparable. Madison (black, dressed up) and Ivory. Both are of unknown origin, although Ivory looks like she has some Labrador in her. Madison is just over three years old and Ivory is about six months younger. They both refuse to grow up and at times play real rough. Madison has on a shirt that blew off the clothesline and to this day we don't know how she got it on her.